Planes, trucks, cars and buses—Aboriginal art made it on each of those. We accept Aboriginal art on canvas, bark and poles, and on many souvenirs. But there are some unusual places where Aboriginal designs have been used. Australia's national airline Qantas had three jets painted with Aboriginal designs to celebrate the 1993 International Year of the World's Indigenous People . Wunala Dreaming is a design by John Moriarty and his wife Ros (Jumbana Group). Using styles from Northern and Central Australia, it features the spirits of Aboriginal people in the form of kangaroos travelling through the red desert landscape. 'Wunula' means kangaroo . The dreaming comes from the Yanyuwa people from Borroloola on the Gulf of Carpentaria , the homeland of John. Planned as a 3-month promotion, the plane became the world's most photographed aircraft and flew for 17 years until it was grounded in 2012 . The jet's design attracted criticism from some Aboriginal artists who suggested employing more Aboriginal flight attendants would have been better than painting the aircraft . The design includes 1,324 irregular dots and 7 different colours. The 67 patterns took 12 days to paint around the clock, and 800 litres of paint . It took 18 months to convince Qantas to do it . Nalanji Dreaming was also painted by John and Ros Moriarty and was launched in 1995. The aircraft was scrapped and sold for spare parts in 2007. The design expresses Australian cultural themes in a lush, tropical colour palette. Yellow sun rays dot intense blue sky, flowers and vines express the rainforest and symbolise tracks between ceremonial places of spirit ancestors when they created the Australian landscape in the Dreamtime. Emerald greens are the colours of the forest, vivid blues are the tropical reef waters. Yananyi Dreaming launched in 2002; the artwork was created by Rene Kulitja, a Pitjitjantjarra woman from Mutitjulu, near Uluru. She was also involved in a truck design in 2010 (see below). 'Yananyi' means going or travelling. Radiating pathways lead to the symbol of Uluru, depicted both as a physical form surrounded by Kurkara (desert oak trees), and as an abstract representation of concentric circles. Blue hills (Tali) rise from the desert landscape, and mala (Rufus Hair - Wallaby) tracks are imprinted on the sand. Lungkata (Blue tongued Lizard) basks in the hot sun. 'Yananyi Dreaming' is the strong Uluru story. Aboriginal artist Paddy Bedford's 2005 painting Mendoowoorrji - Medicine Pocket inspired the fourth Aboriginal art design for a 737-800 aircraft, launched in 2013. The artwork depicts part of the artist's mother's country. It's taken 18 months to get the aircraft ready with Boeing painters for the first time using brush and other hand painting techniques to translate the work's shading and textural elements on to the fuselage. The plane joined the Qantas domestic network in November 2013, flying east-west and intra-WA routes. Designs of four Anangu artists from Maruku Arts, a co-operative based at Uluru in the Northern Territory, adorned three new trucks released in November 2010 in Australia. The artists are Judy Okai, Rene Kulitja and Billy and Lulu Cooley. Ms Okai's design depicts a fight between a senior python woman called Kuniya and a Liru warrior, one of the venomous snake men . Anangu believe the marks of Kunia's anger can still clearly be seen on the face of Uluru. The BreastScreen digital mammography truck travels all across Queensland, the Northern Territory and to the Torres Straits. This artwork displayed on the truck encourages Aboriginal and Torres Strait Islander women to access screening. "This painting is about encouraging women to be screened rather than have to scream for help. The woman [to the left of the logo] represents those we have lost to breast cancer in the past, as well as those we can save in the future through screening for early detection of breast cancer. "The painting uses the hibiscus to represent the breasts in an indirect fashion. This is important because it makes coming for screening acceptable rather than a shameful or clinical experience. The diverse colour palette for this painting reflects the need for the mobile service to be welcoming to all women living [in] the areas visited. Aboriginal artist Graham Rennie Biggibilla supplied the design for this 1998 911 Porsche coupe on the occasion of Porsche Australia's 50th anniversary. The car is now in the Porsche museum in Stuttgart, Germany. Queensland Aboriginal artist Michael Connolly had the idea to design Aboriginal number plates to express his pride in his Aboriginality . A Queensland series of the number plates was unveiled in 2005, and Victoria followed in 2007. The Victorian version showed the word 'mob' which is a term used by Aboriginal people to refer to themselves. The Northern Territory government rejected Mr Connolly's proposal . The background colours of the number plate are representative of the Aboriginal flag. Circles represent the circle of life, the lines joining the circles represent the links between all the Aboriginal clans Australia-wide, and the feet represent those of Aboriginal people who continue to walk--and drive--this land . Aboriginal number plates convey a sense of pride to their owners. "Instead of walking this land together, we can drive together along the road to reconciliation," says their creator, Michael Connolly . In 2007 the State Transit Authority of New South Wales organised a competition for school children to design the artwork for two buses operating in the south east of Sydney . The winning entries were incorporated into the final design for a general art bus and an Indigenous bus which were painted by local youths during the July school holiday period. The project, aimed at tackling anti-social behaviour on buses, was a joint initiative of State Transit, a number of Government agencies and community groups. 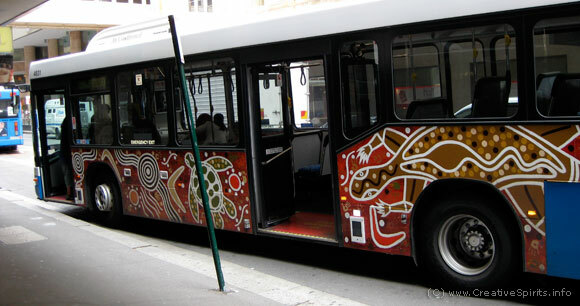 Aboriginal art on a the Aboriginal-themed NSW State Transit bus. In May 2011 a Queensland Rail Tilt Train was transformed by 301 metres of Queensland Aboriginal artwork into Australia's longest moving canvas. The Tilt Train was delivered in partnership by Queensland Rail Travel and Arts Queensland. A second train followed in September the same year . All seven carriages of the first train feature artwork by Aboriginal artist Judy Watson and Torres Strait Islander Alick Tipoti, the second train was transformed by Lockhart River artist Josiah Omeenyo on one side and by 24 artists from the Cardwell and Tully regions on the other. Judy's artwork explores the fragile nature of Queensland's scenic coastline with recurring themes of shells, middens, fossils and termite mounds, while Alick's work on the other side of the train features striking black and white patterns representing the historic stories of Torres Strait heroes and warriors. Josiah's artwork represents the coastline of his home on Cape York, while the artwork from Girringun Aboriginal Art Centre reveals contemporary interpretations of ancient arts and cultural practices, including traditional wooden fire-starters re-imagined as bold ceramics, boomerangs painted to reflect current affairs and baskets made from lawyer cane. Paul Herzich is an Aboriginal landscape architect and artist from Adelaide. Since 2010 the Kari Munaintya Tram in Adelaide displays one of his artworks for National Sorry Day, Reconciliation Week and NAIDOC Week . Kari is the Emu. He is featured meandering across the Kaurna landscape. The concentric circle patterns across the tram represent all 29 tram stops along the Glenelg to the Adelaide Entertainment Centre tramline as diverse "tram stop meeting places". The front of the train acknowledges all 39 major Aboriginal nations whose country is either fully or partly located in the state of South Australia. Finally, at the top of the centre carriage are the dates of the celebration of Reconciliation Week and NAIDOC Week. Description courtesy of Jordana Angus. Description and photograph courtesy of Paul Herzich.